being patient & trusting your journey. In the past year, I feel like I’ve become such a spokesperson for patience and truly trusting your journey. Around this time last year, I was in a really uncomfortable space. I graduated from college in May of 2014 and immediately began a summer internship. Of course, July came around in the blink of an eye, my interning days were soon to be over and I knew that it was time to begin looking for a full time career job. Throughout the previous 4 years, I was totally under the impression that if I did everything that I was supposed to do, intern…complete my degree…etc...that eventually a job in PR or marketing would be waiting for me as soon as I was ready. Not quite. Now I didn’t expect the process to be easy.. but I don’t think that I’ve ever been told no as many times as was over those next few months. I was determined, applying for at least 10 jobs a day, but nothing ever seemed to come out of it. I decided that I had to start bringing in some type of income, so I began working at a golf course call center. It was the furthest thing from what I wanted to be doing with my life. I literally cried every single day that I walked to that job. I felt totally unfulfilled and discouraged and I was afraid that I was wasting time and that I’d get stuck at a job that I hated. I knew that working at a call center was not benefiting me professionally, so I left, going against almost everyone’s advice. Luckily, I found a copy writing internship pretty quickly at a marketing research firm. It still wasn’t quite where I wanted to be and it wasn’t a full time opportunity, but it looked much better on my resume. So, you can only imagine how excited I was when I finally earned a phone interview for a PR Coordinator position that seemed to be like my dream entry level job. I thought that it was finally my time. I made it to the second round and scored an in person interview at a coffee shop, which I thought went pretty well. Then….nothing. I followed up, thanked them for the interview, but after that I never heard from them again. I was crushed. I just couldn’t understand why this wasn’t happening for me. Everyday I scrolled through social media and it seemed like everyone around me was securing job offers left and right and living seemingly fulfilling after grad lives…yet no company would even give me a chance. Earlier this week, I was on my TimeHop app and realized that one year ago to the date, I received the official offer for the amazing job role that I’m in right now. My initial thought was, “Wow, I can’t believe how fast a year has gone by..” and then I immediately reminded myself for the millionth time how blessed I am. Later that day, I got off of the Green Line train and began walking to an event. The area immediately looked familiar and then I saw it, the coffee shop. I’ve become a firm believer of the saying, “What is meant for you will be yours.” It took a very long time for me to truly understand the importance of believing in that phrase. I now know that the job I interviewed for at that coffee job was not meant for me. All of those jobs that told me no before that interview weren't meant for me either. Sometimes I feel the need to pinch myself when I think about how great I have it at my current position, a position that wasn’t even open at the time that I interviewed at that coffee shop. All of those no's were simply leading me in the direction to the right yes. I strongly believe that we must go through different situations, good and bad, on the course of our journey... as everything that we experience is just preparing us for that next step. Be patient and don’t even bother comparing your unique journey to anyone else. All you can do is give life everything that you’ve got and ultimately trust that your time is coming. This is such a timely reminder for me. 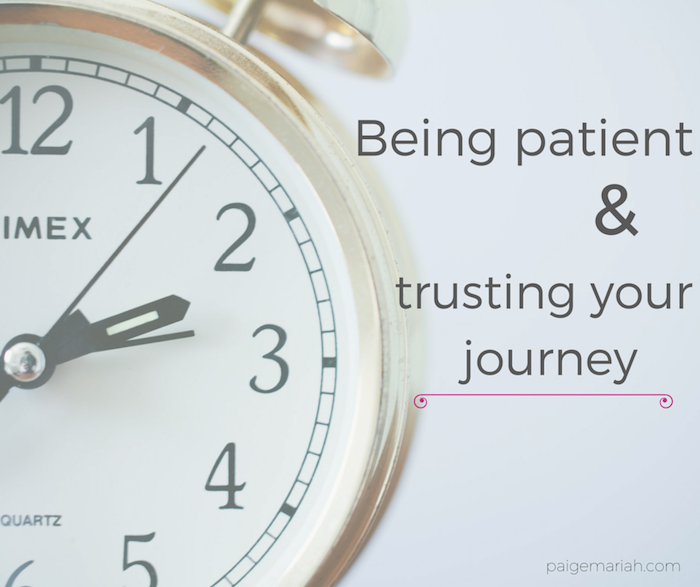 I've learned that being patient and trusting the journey is an active waiting. Doing the right thing while waiting is a period of self grooming and preparation. Sometimes it seems like I've been waiting most of my adult life on a degree, job, financial opportunity, relationship, etc., etc., -- this list goes on and on. It's all part of the journey-- my journey. 'Being confident of this very thing, that he which hath begun a good work in ME will perform it until the day of Jesus Christ' Phil. 1:6. What a great post, Paige! It's a powerful story and one we should always try to remember. We get so caught up in what we think we want, and crushed when those things don't go as we plan, it's hard to see the big picture sometimes. I'm really glad you got the job that was meant for you. Thanks so much for sharing! I loved this! This was very well written, and this message came at the perfect time for me. Thank you for sharing this!